Early in the morning on January 9, 1965, 47 million cubic metres of rock broke away from the steep upper slopes of Johnson Peak (16 km southeast of Hope) and roared 2,000 m down the mountain, gouging out the contents of a small lake at the bottom, and continuing a few hundred metres up the other side (Figure 15.1). Four people, who had been stopped on the highway by a snow avalanche, were killed. Many more might have become victims, except that a Greyhound bus driver, en route to Vancouver, turned his bus around on seeing the avalanche. The rock failed along weakened foliation planes of the metamorphic rock on Johnson Peak, in an area that had been eroded into a steep slope by glacial ice. There is no evidence that it was triggered by any specific event, and there was no warning that it was about to happen. Even if there had been warning, nothing could have been done to prevent it. There are hundreds of similar situations throughout British Columbia. What can we learn from the Hope Slide? In general, we cannot prevent most mass wasting, and significant effort is required if an event is to be predicted with any level of certainty. 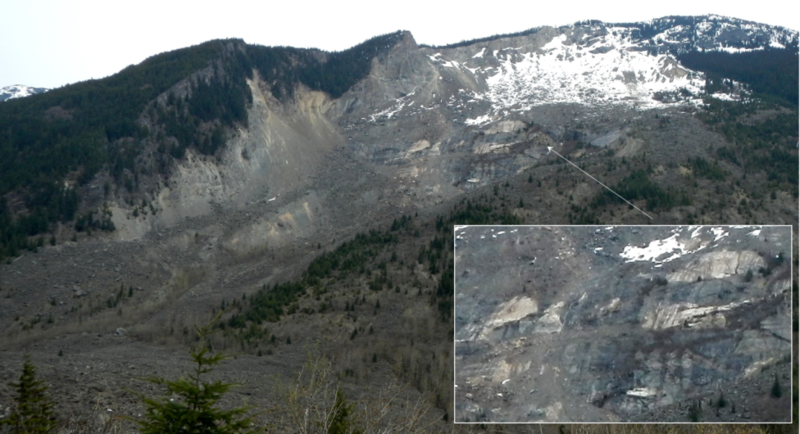 Understanding the geology is critical to understanding mass wasting. Although failures are inevitable in a region with steep slopes, larger ones happen less frequently than smaller ones, and the consequences vary depending on the downslope conditions, such as the presence of people, buildings, roads, or fish-bearing streams. An important reason for learning about mass wasting is to understand the nature of the materials that fail, and how and why they fail so that we can minimize risks from similar events in the future. For this reason, we need to be able to classify mass-wasting events, and we need to know the terms that geologists, engineers, and others use to communicate about them. Mass wasting, which is synonymous with “slope failure,” is the failure and downslope movement of rock or unconsolidated materials in response to gravity. The term “landslide” is almost synonymous with mass wasting, but not quite because some people reserve “landslide” for relatively rapid slope failures, while others do not. Because of that ambiguity, we will avoid the use of “landslide” in this textbook. Chapter 15 Mass Wasting by Steven Earle is licensed under a Creative Commons Attribution 4.0 International License, except where otherwise noted.